Eliminating clutter is an important and necessary whether you’re moving, remodeling or just realize that you need to get rid of the clutter. The problem is, many people have trouble deciding what to keep, what’s actually valuable, and what’s just plain trash. If you’re one of said individuals, it’s probably a good idea to get someone with an objective opinion to help you out and be rational. Not only will you get some extra space in your home, but it is also a great way to find inventory for a garage sale, to donate, or to be sold online. Now, I know the decision making process for reducing clutter can be difficult, but here are a few helpful techniques to move the process along swiftly and smoothly. Remain standing when organizing clutter, if one sits down, one tends to dwell on items, get distracted, or grow tired and call it quits. Each item should be analyzed using a three-second rule, because if it’s truly of value or trash, it should take no longer than three seconds to determine what pile to put an item in. This will encourage the decision making process and ensure the operation moves swiftly. There should be a separate category for items that a decision can’t be made about, so revisit this category after every item has been looked over, that way, you will feel like you’re on a roll, and you don’t want to stop now, because you’re havin’ such a good time. You might be surprised by how quickly decision making will come to you by that point, so keep that blood flowing and your hands moving. Items that are not being kept can go into one of three categories; one category is for items of value that can be sold online or at a yard sale, another category is for items that can be donated, and finally, the rest should be thrown out with the garbage. If you’re then faces with a sub-category of items you’re unsure whether or not are of value, a quick eBay search can determine that for you. Large items like furniture should always be sold in person at a garage sale or have an ad placed in a local paper, it would be impractical to ship something so large. Clean articles of clothing are always great items to donate, but just be sure that everything is donated the day it’s sorted, otherwise you might find yourself going through the items again, and try to tell yourself that you want to keep them after all. Finally, everything left should be thrown away, and again, thrown away in the same day. No dumpster diving allowed. There are some items that will be kept even though they are used very little, like holiday decorations or your baby’s first onezie, these items are given a thumbs up to keep, but if you have several onezies, choose one, and get rid of the rest. Be rational, you can do it! Organizing all of these nostalgic items is necessary and can be fun, just don’t get too emotionally involved, keep your eyes on the prize. When everything is sorted, and what is trash is in the trash, start deciding what items that are being kept can be packed safely away in boxes and stored in a storage unit, for instance, storage units in Huntington Beach. These items should be revisited every 3-6 months to ensure everything is totally necessary. 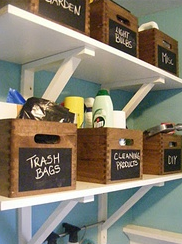 After you’ve cut down on the clutter, take a look at your home. Look what you accomplished. Do you not relish in the feeling of relief knowing that you did an awesome job? If you have young children, they should also be encouraged to go through their belongings, this ensures healthy habits for years to come. Mike has been a freelance writer for a number of years, but one of his true passions is home-improvement. Mike is currently promoting self storage in Bloomington CA, and wants to wish everyone a stress-free and easy de-cluttering.